Buy Philips MMS-4545B 2.1 Channel Speakers System (Black) @ 22% Discount. Be at the heart of the movie and gaming experience and totally immerse yourself in sound. Connect your speakers to all your gear. A great way to listen to your MP3 player, PC, TV, CD, DVD and all your multimedia stuff. This Philips PC speaker provides good sound quality with a rich bass experience from a loudspeaker box system. Unique subwoofer design produces a much deeper, richer bass. You also have the possibility to set the bass level to your choice. Thanks to the compact design you can easily carry the power solution with you when you are on the go. Upgrade your home entertainment system with the Phillips Speaker. It comes along with a remote control that lets you adjust important settings according to your preferences. These speakers are ideal to use for parties and other occasions. This speaker gives you booming sound quality with superior bass that is sure to upgrade your listening experience. Philips is among the world leaders in the production of electronics that are innovative, durable and satisfy consumer requirement. The engineering brilliance and modern designs have made Philips one of the most sort after brands in the world.,Kindly Unplug the mains if not in use. 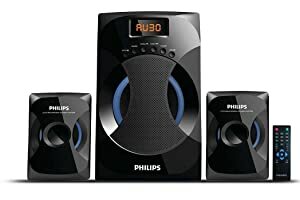 Best Cheap Deals For Philips Home theatre, Grab Cheap Philips MMS-4545B 2.1 Channel Speakers System (Black) Online.